In my rental apartment in Amman, I’m making use of the odds and ends left behind by the previous tenant — a few pots and pans, a coffee ibrik, a rackety little blender. In the living room, there’s a toy oud, a few books (including The Motorcycle Diaries by Che Guevara), a hexagonal jewelry box with mother of pearl inlay, and a little cedar stand with carved wood hands gripping a miniature copy of the Holy Koran. 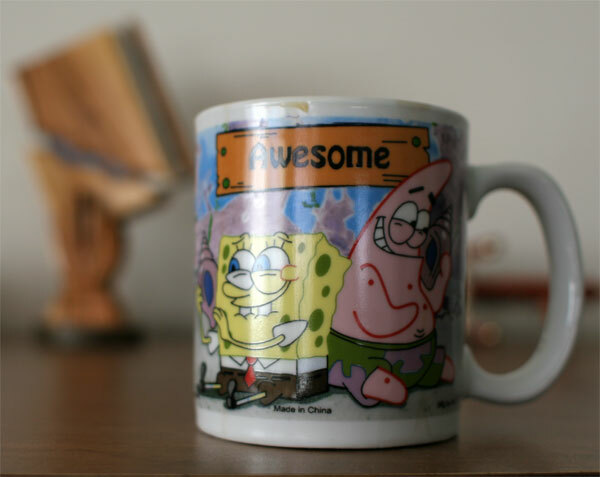 The cupboards in the kitchen are fairly bare, but I laugh every morning when I drink coffee from an “awesome” Sponge Bob Squarepants mug. And to think they left that behind. When I first looked at the photo of the mug I saw “Wesome” but I did notice upon closer inspection it says “awesome” I like the wesome since you are there alone with your mug. Do you brew your own coffee or is there a shop nearby?